Tottenham fans may be concerned by news that Harry Kane could miss the rest of the season – but they can rest assured they have another proven goalscorer to step up in Son Heung-min. Kane suffered a potentially season-ending ankle injury after a nasty tackle from Fabian Delph in Spurs’ 1-0 win over Manchester City in the Champions League, with Mauricio Pochettino confirmed afterwards it may be the same issue the striker suffered in the 2016-17 season. We’ve taken a look at all the times Son has stepped up in the England captain’s absence to calm any concerns from Spurs supporters. At the start of 2016-17, Kane missed 10 Spurs fixtures due to an ankle injury, but that just allowed Son, coming off the back of an underwhelming first season in England, to flourish. The forward started on the wing against Boro, with Vincent Janssen instead leading the line, but he managed to score two excellent goals in the opening 23 minutes to give Spurs a commanding lead, and they held on for a 2-1 win. Two goals doubled his tally for the season, meaning by September he had already matched his total from his debut campaign in north London. Yet again Son started out wide for Spurs, only to be moved into the centre-forward position just after the hour mark when Janssen was replaced by Georges-Kevin N’Koudou. The tactical switch paid dividends as Son was played through on the shoulder of the last defender to squeeze the ball past goalkeeper Igor Akinfeev to net the only goal and secure an impressive away win for Tottenham, though they still crashed out at the group stage of the Champions League. When Kane was ruled out with an ankle injury once against towards the end of 2016-17, Pochettino persisted with Janssen as a centre-forward at Turf Moor, but his side struggled for any attacking fluency. Spurs had just gone 1-0 up through Eric Dier from a set-piece when Son replaced Janssen and immediately made an impact. Just four days later, Pochettino gave Son the chance to lead the line from the start, but this time the South Korean needed the help of Janssen to provide an assist as Spurs, trailing 1-0 in the 87th minute, scored three late goals to take home all three points from South Wales. Fast forwarding to the current campaign, Spurs fans were left panicking after Kane picked up an injury while Son was away on international duty with South Korea at the Asian Cup. But South Korea’s surprise elimination at the hands of Qatar in the quarter-finals saw supporters breathe a sigh of relief as Son returned earlier than expected to smash home a late equaliser against Watford before Fernando Llorente bagged a winner. Look, let’s just say Martin Dubravka really f*cked this one up, but it’s no surprise it was Son coming up with a late winner for Tottenham. A strange game in which Spurs led Leicester 2-0 despite the visitors enjoying plenty of chances at Wembley. Jamie Vardy had come off the bench to miss a penalty just minutes before Christian Eriksen doubled Tottenham’s lead but went on to pull a goal back as Leicester threatened to find an equaliser. But when Son was sent free on the counter-attack there was only one outcome as the forward kept his cool finish calmly and wrap up all three points. The final fixture Kane missed due to that specific injury, Spurs faced a difficult task against a Borussia Dortmund outfit which had taken Bundesliga by storm up to that point in the season. 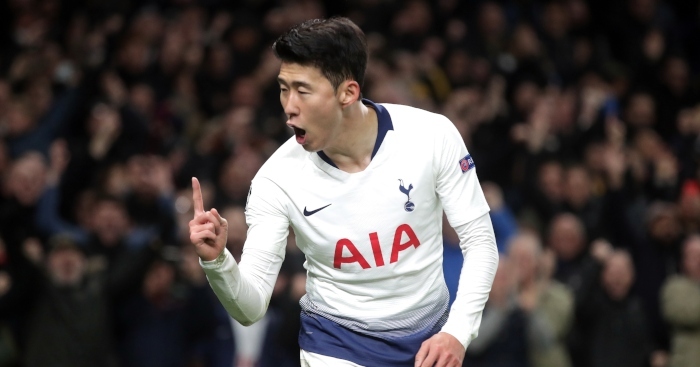 After a goalless first half in the first leg of the Champions League round of 16 tie, Son opened the floodgates by scoring just after the break as Tottenham went on to record an impressive 3-0 win. If Spurs fans were to be asked what their best chance of beating Manchester City in the Champions League would involve, they probably wouldn’t have mentioned Kane being forced off with a potentially season-ending injury after less than an hour. Yet it just gave Son, who had already scored the first Premier League goal at Spurs’ new stadium, the chance to write his name once more into the record books by bagging the first Champions League goal at the ground and giving Tottenham something to hold on to for the return leg.